Those who use dollars outside the US continuously pay a contribution to the US. It comes in the form of an inflation of 1.25 million dollars per minute. This is the result of the fast increase of the US foreign debt. Half of all USA's imports are simply added to the foreign debt and paid for by the foreign dollar holders through inflation. Moreover these dollar holders do not seem to realize, that the dollar rate they are looking at, is nothing more than a dangerous facade. If they don’t understand what is still keeping it upright, the facade may hit them by surprise. Meanwhile, well camouflaged, the dollar is at the center of several US’ conflicts. Since 1971 everyone who wants to import oil, has to buy dollars first. That is where the fun starts for the US. Almost everybody needs oil, so everybody wants dollars. But once again, at the moment accusations are loaded with emotions humans switch off their intelligence. Reason is no argument for peace anymore. The theatre is only about the launched accusations. And because, as a result, only specialists of weapons of mass destruction or nukes are called upon to give their opinion, nearly nobody finds out what the conflict is really about. In Venezuela, since many years, the US tries to pull down President Chavez, pretexting he is a dangerous communist. Chavez has nationalized the oil industry and has set up Barter-deals to export Venezuelan oil in exchange for medical care from Cuba and others. In Barter deals there is no necessity for dollars and the US has no profit from the oil trade. But in 1989 Saddam accused Kuwait of flooding the oil market and making the oil price go down. The following year Saddam tried to annex Kuwait. It led to an immediate turn around of the attitude of the US. With the annexation Saddam would dispose of 20 percent of world oil reserves. The Iraqis were chased out of Kuwait by the US, with an alliance of 134 countries, and condemned to water and bread by a UN-embargo that lasted ten years. Although the US sought a way to re-establish its influence in Iraq, Saddam’s switch to the Euro on November 6, 2000, would lead to the US invasion. The dollar sank away and in July 2002 the situation got that serious, that the IMF warned that the dollar might collapse. A few days later the plans for an attack were discussed at Downing Street. One month later Cheney proclaimed it was sure now, that Iraq had weapons of mass destruction. With this pretext the US invaded Iraq on March 19, 2003. The US switched back the oil trade into dollars on June 5, 2003. There is a huge difference between trading Iraqi oil in euros and trading it in dollars. This will be explained below. Meanwhile the US tries to frustrate all competing projects of other countries. Of course, this led to multiple conflicts of interest with Iran. George W. Bush would pretext the presence of Osama bin Laden to start a war against Afghanistan. In 1999 Iran publicly stated it wanted to accept euros for its oil as well. Iran sells 30 percent of its oil production to Europe, the rest mainly to India an China and not a drip to the US, as a result of an embargo established by the US itself. In spite of Bush’s threatening tale, mentioning the country in his famous “axis of evil”, Iran started to sell its oil in euros from spring 2003. After that, Iran wanted to establish its own oil-bourse, independent from the IPE and NYMEX. It would start on 20 March 2006. Considering the very weak health of the dollar at that time, a success of this bourse could have led to a catastrophe for the dollar and thus for he US. That is why tensions were very high at the beginning of 2006. Finally the opening of the oil-bourse was postponed. After that Putin established an oil bourse in Russia as quickly as possible, which took away the interest of the Iranian oil bourse. The US accuses Iran of wanting to make nukes. Because the US has not sufficient influence to switch back the oil trade into dollars, it probably hopes that the Iranian nuclear sites will be bombed once again so Iran would have to consume its oil instead of selling it in euros. Moreover, a masterly plan has been conceived to take possession of the world market for nuclear fuel, in concert with a few other countries and using Iran as the pretext and the test case. With this plan the demand for dollars would be secured for a long time, even after the oil age. Since 8 June 2006 Russia too has turned its back to the dollar. By selling the dollar surpluses to central banks, Putin took care that it had no influence on the dollar rate. However, the basis for the world wide dollar demand has decreased a lot. The US needs Russia for its plans to take possession of the world market for nuclear fuel, so a revenge by the US is unlikely. The dollar economy is not limited to the US. Oil reserves traded in dollars belong to it too. Also enterprises, banks and investments, anywhere in the world, belong to it when paid with dollars. They are like small islands of the dollar economy. Benefits and dividends are flowing back to the owners. The value of the investments is influenced by the rate of the dollar. Oil sellers, receiving their proceeds in dollars, are actors in the dollar-economy and usually behave like perfect representatives of the US’ interests. They consider this as their own interest. Since January 1993 the Euro is quoted. 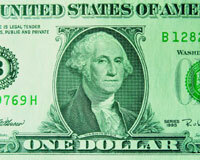 In July 2005 the rate is identical to what it was at its introduction: $1.22. The new currency has experienced quite some fluctuations during its short life. From the end of 1998 the Euro slides away, until the moment Saddam Hussein switches to the Euro in November 2000. Although the US switched the oil trade back into dollars in June 2003, the Euro continued its rise. Since spring 2003 Iran had started to sell oil in euros. The Euro has become a small world currency. Between July 2004 and July 2005 the part of the dollar in world trade went down from 70 percent to 64 percent. A bit less then half of these 64 percent is related to US foreign trade. If the Euro wants to become as mighty as the dollar, it has still a long way to go. In principle, the Euro contains the same risks as the dollar. As long as there would be a motor for a permanent demand for euros like, for instance, oil sales in euros, the Euro zone could make debts and let it increase indefinitely. To avoid such debts, the Euro zone would have to export the equivalent of all euros needed outside its borders and keep the same amount in foreign currencies in their central bank. Why would they? The credit trick worked finefor the US during more than 30 years!